Thousands of delicately carved spires rise from the brilliant amphitheater of Bryce Canyon National Park. Millions of years of wind and water at work have etched out the pink cliffs of Bryce Canyon National Park. Cascading waterfalls, towering cliffs and the Virgin River are the centerpieces of this magnificent park. There are hiking trails and a visitor center. Rugged western landscape, a museum, hiking trails and the pioneer village of Fruita are well worth seeing. View one of the world’s greatest wonders from high on the Kaibab Plateau. Hiking, mule rides and a visitor center are at the North Rim. Closed in winter. Bullfrog Marina on Lake Powell is accessible via the Burr Trail southeast of Boulder. Boating, swimming and hiking are among the activities. Bullfrog is 147 miles east of Bryce Canyon. The Wahweap Marina near Page, Arizona, is another section of Lake Powell. 1.7 million remote acres of desert wilderness, canyons, unique rock formations and wildlife are the main attractions at one of the nation’s newest national monuments. Please check locally for road and weather conditions before driving on any of the dirt roads in the monument. The circle of painted cliffs is similar to Bryce Canyon but smaller. It is located on Hwy 143 near Brian Head and Cedar City. Hiking, picnicking, camping and photography are the main activities in this surrealistic setting of unusual rocks and cliffs. Located 9 miles south of Cannonville. Walk along the trails to view large specimens of petrified wood and dinosaur bones. The park is popular for hiking, camping, picnicking and fishing. A museum and partially excavated prehistoric Indian village are well worth exploring. A neighbor and cousin of Bryce Canyon, Red Canyon has bright red cliffs, hoodoos and pines making this area of the Dixie National Forest a photographer’s paradise. Hiking, camping, biking, picnicking and horseback rides are popular. A hike to the lower falls passes desert-varnished rock cliffs dotted with Indian ruins and rock art. The cascading Lower Calf Creek Falls seems like it should be a mirage among the slickrock sandstone. Simply spectacular! 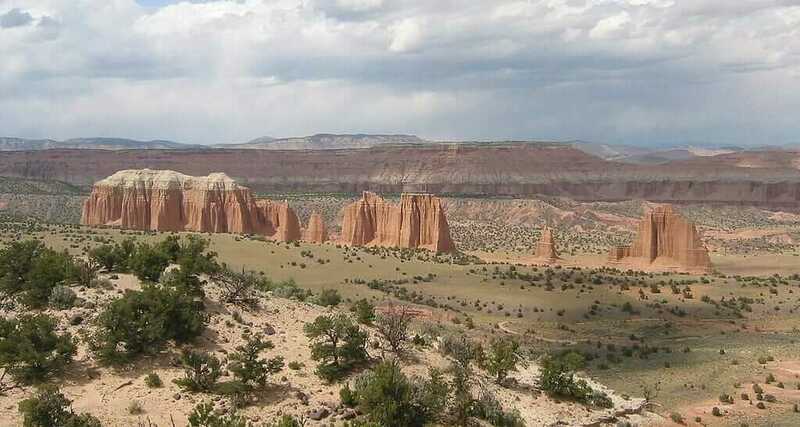 The Calf Creek Recreation Area is part of the Grand Staircase-Escalante National Monument.